It’s great getting feedback from Photobookgirl.com readers. From time to time I like to post some of the Q&A to my blog if I see the question come up more than once, or if I think it may be of general interest to everyone. In this case, I think the wrong reply email may have been entered into my contact form, so it bounced back. So I hope the reader that asked this question sees this post! Q: Hi, other than adoramapix which offers a 8″x12″ photo book, all the other companies offer odd (non standard aspect ratio) book sizes (8″x10″, 8 1/2 x 11″, etc). The proper aspect ratio is 2 to 3, ie. 4″x6″, 8″x12″, 12″x18″, etc. My question is – what happens to the dimensions (appearance of my images/photos when they are placed full size/bleed into these photo books with odd sizes? Is the photo distorted or cropped? A: From my experience the photo is cropped rather than distorted. You can confirm that in the preview function provided by the book companies. Yes, isn’t it funny that for instance, most photo frames are 8×10 and not 8×12? In the past I have had to take scissors to trim down my printed photos in order to fit them in a conventional frame. You may be interested to see a post where I touched upon your question – with examples to show the degree of image loss depending on book size/shape. 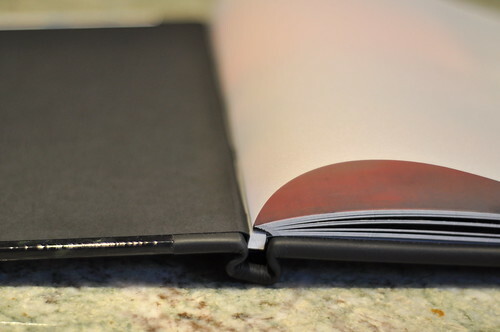 For the most part, the photo book companies all tell you to expect some cropping on every page and to keep anything important a certain measurement away from the edge (like titles and text for instance). Most have a “safe zone” that’s highlighted while you’re creating the book so you know what may be trimmed off. However, I haven’t noticed the cropping to be the maximum they say could happen in past experience. If it is really important to have all of the image showing, then you have to do something less than full page bleed.